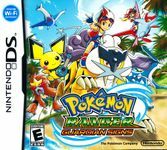 Pokémon Ranger: Guardian Signs is an action role-playing game video game for the Nintendo DS. It is the sequel of Pokémon Ranger and Pokémon Ranger: Shadows of Almia. Gameplay revolves around capturing Pokémon with the Capture Styler, which now lets you call out your Pokémon for support and use "Ranger Signs" to call Pokémon to help in captures. Other features include four player cooperative play with unique missions. The game also includes Wi-Fi mission downloads, one of which gives you access to Deoxys, which can be moved to the DS's other Pokémon games. According to the Pokemon website, you can also encounter Entei, Raikou, and Suicune. Source: Wikipedia, "Pokémon Ranger: Guardian Signs", available under the CC-BY-SA License.